Mission Greenfield is changing the way of life in Kenya, as well as the fields. In June of 2012, POET Founder Jeff Broin and his family were on a mission trip in Kenya, helping to build a school for deaf children. The entire time he was there, though, Broin couldn’t stop studying the Kenyan corn. When Broin talked to a local farmer, the man explained that the region was in the middle of a drought. “There will be a famine,” the farmer’s wife told him. Nearly 75 percent of Kenya’s population relies on farming for their livelihood. With 45 percent of Kenyans living below the national poverty line, the country’s frequent droughts can be devastating. 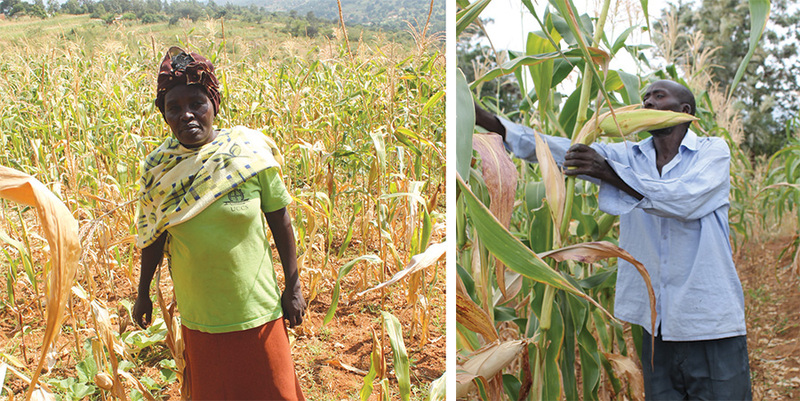 LEFT: :Rebecca Mbithi by a plot where she planted the conventionally used indigenous varieties with shallow tilling. She will not harvest corn from this plot. RIGHT: Daniel Muthoka of the Kianzio village is inspecting his maize which was planted with a new variety and deep tillage. For the remainder of the ten-day-long mission trip, Broin spent his free time talking to farmers, studying soil and researching local farming practices. When he returned to South Dakota, Broin couldn’t stop thinking about that corn crop, 8,500 miles away in the town of Tawa, Kenya. He knew that POET could make a difference. Broin gave a report to the POET board, made some calls to DuPont to ask about supplying seed and reached out to Farm Input Promotions Africa (FIPS), a Kenya-based non-profit that works with local farmers to increase yields through improved crop varieties and better crop and soil management practices. In September of 2013, the POET Foundation created Mission Greenfield, a project designed to improve agricultural yields in Africa by helping to fund dozens of Village Based Advisors (VBAs) around the Tawa region in Kenya. These VBAs are area farmers (half of whom are women, who make up 80 percent of Kenyan farmers) who work with Mission Greenfield (through FIPS) to learn effective agricultural practices, which they can then pass along to other farmers in their region. In less than two years, Mission Greenfield’s target area has seen a significant increase in crop yields. The same fields that produced one bag of corn per quarter acre just a year ago are producing up to five bags this season. The number of malnourished households in this region has been reduced by 25 percent. The statistics, while impressive, don’t tell the human side of the story. Paul Seward has spent the past two decades working to improve agricultural development in Kenya and Tanzania. As the Managing Director at FIPS, he serves as the in-Kenya contact for Mission Greenfield. And he sees the real-life results of those numbers. In sub-Saharan Africa, that difference can sometimes be as basic as helping farmers to vaccinate their livestock. In the Tawa region, chickens were dying from Newcastle Disease and Mission Greenfield was able to help farmers get access to the vaccine. For many farmers, that meant their chicken population increased from an average of three chickens last year to as many as 30 this year. That means ten times as many eggs. That means extra chickens to sell for things like school fees, medicine and clothing. That, coupled with those extra crop yields – with increases up to five fold – can mean the difference between sustenance farming and farming that allows families to not just survive, but thrive. With 60 VBAs each working with 200 farmers, Mission Greenfield is impacting 12,000 farms – an estimated 72,000 people. It’s an impact that comes primarily through technology, donations and education. Mission Greenfield helps supply small seed packs, which allows farmers to experiment with improved crop varieties on their own farms. When research revealed that deeper tillage could increase yields, advisors encouraged farmers to use a hoe-like tool called a spring jembe, which breaks through the hardpan layer of soil and allows more rainwater to penetrate the soil. Ruth Mwikali by a plot where she planted an improved maize variety after deep tilling her land using a spring jembe (hoe). 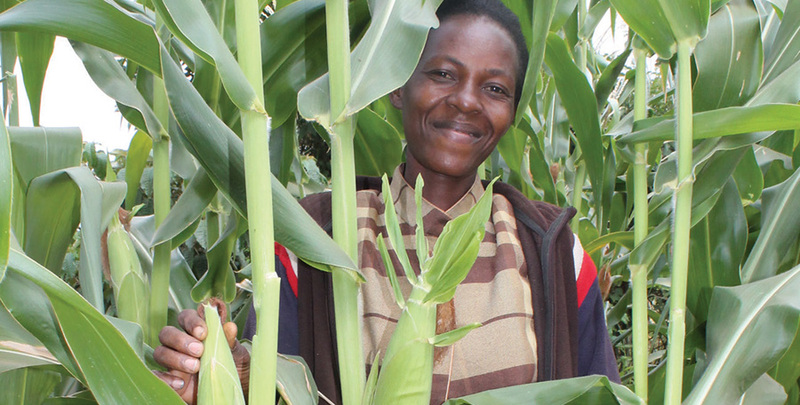 Kenyan farmer Ruth Muli took advantage of both a new seed variety and the deeper tillage created by the spring jembe. 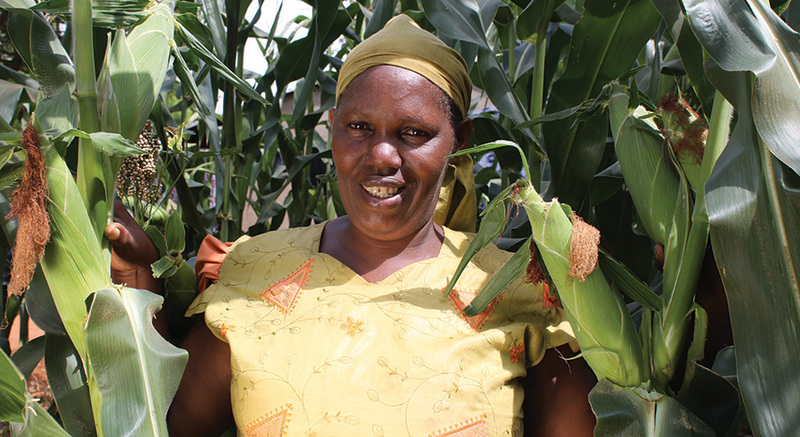 “I expect to harvest five bags of maize, which will be enough to feed my family for a year,” she says. Photos provided by FIPS show Muli surrounded by green, eight-foot-high corn stalks ripe with ears. Muthei Maweu, a farmer in the village of Kithiku, experienced good yield with one of the small seed packs last season and used that variety with deep tillage this season. “I purchased [the P2859W maize variety] because it performed well when I planted the promotional pack last season,” she says. “I planted the seed late but I will still harvest a good crop.” In previous years, with local seeds and old techniques, Maweu harvested roughly 400 pounds of corn. This year, she expects to harvest more than 1,000 pounds. For Seward, those are the kind of first-person stories that represent the progress that can change a family, a village, a country and eventually the world. For POET, those real-life results are the reason they have committed to continuing – and expanding – Mission Greenfield. Kyanzio Village Based Advisor Catherine Mwende by a plot where she incorporated deep tillage using a spring jembe. Over the next year, Mission Greenfield’s goals include reaching another 5,000 farmers, distributing another 100,000 small seed packets of new varieties, vaccinating 160,000 chickens, creating 800 trial plots and 60 tree nurseries and stocking six tons of seeds. That 25 percent decrease in malnourished households within this region could, at this pace, climb as high as an 80 percent decrease in malnourished households within four years, according to Broin. For Broin, it is those personal connections that represent the bigger picture – the human connections that can change the world, one friend, one farmer at a time. What started as a family-focused mission trip – a trip that Broin says he was talked into by his wife Tammie – turned into a POET Foundation project. All because Broin couldn’t stop studying that questionable Kenyan corn.